Some plants are bottom-dwellers and prefer to be anchored into the substrate. 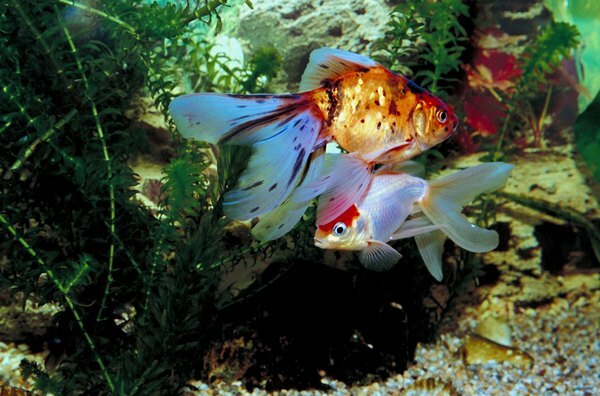 From sprucing up your aquarium with a more natural appearance to making use of nasty fish waste, live aquarium plants come with a host of benefits over their fake counterparts. On the flip side, they require more care. Lighting, fertilizer, basic maintenance and planting preferences all factor into a live plant's health. The first step in putting your plants on the path to a healthy life is placing them in your tank properly. Always research which plant you're adding so you know its planting preference. Some plants, such as water lettuce and duckweed, are considered floating plants and thrive when plopped in and allowed to float along the surface. Some plants will only prosper if you bury their roots. In contrast, mosses don't have roots at all, and many aquarists tie them onto objects, such as logs and rocks, or weigh them down onto the substrate to create a moss carpet. A little research into what plant you're getting will go a long way in helping it thrive in your tank. Note that duckweed can grow quickly and some aquarists think of the plant as a pest. Aquarium plants fit into three categories according to their lighting needs; low light, medium light and high light. FishChannel.com defines low light as 1 1/2 watts per gallon or less, medium light as 2 watts per gallon and high light as 3 watts or more per gallon. The site notes that this only applies if you're using broad-spectrum florescent bulbs or metal halide bulbs, not incandescent bulbs. Providing a plant with less light or more light than it requires doesn't necessarily mean it will die, but the lighting needs generally reflect the plant's best chance for ideal growth. Turn your lights on and off around the same time each day, leaving them on for about 10 to 12 hours. If you have an unpredictable schedule, you may want to purchase a timer. FishChannel.com points out that only an aquarium that falls into the high light category needs added carbon dioxide. You can create your own carbon dioxide system or purchase one. Stock your tank with low-light and medium-light plants and you won't need to add additional fertilizer. High-light plants, however, do require supplemental fertilizer. Fertilizer typically comes in liquid and tablet forms. Root-feeders prefer tablet fertilizers, while non-root feeders prefer liquid fertilizer. You can use a combination of the two. Always follow the manufacturer's recommended dosing amount. Regular plant maintenance ensures your freshwater plants grow healthy, look great and continue to thrive. Look at your plants every day for dying or dead portions and clip them off. If the entire plant is dead, remove it from your tank so that it doesn't increase ammonia levels. Inspect your tank daily for uprooted plants, and anchor them back into the substrate. If you have snails, you'll probably encounter the occasional uprooted plant. Some plants can grow out of control and may need to be pruned back so that they don't take over your tank, affect filter output or blot out the available light.